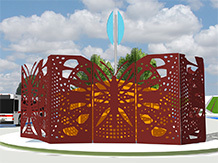 West Baltimore MARC Station "Butterfly Gateway"
“Butterfly Gateway” utilizes digital tools and laser cutting to realize a sophisticated, patterned screen to transform the West Baltimore MARC Facility restroom into an iconic work of Art and a Community Gateway. The nature of this proposal is transformational and uplifting. The new transit facility is a symbol of connection and mobility, marking its importance as a future hub and nerve center of growing activity. Similarly, the image of the butterfly is a symbol of transformation and journey. 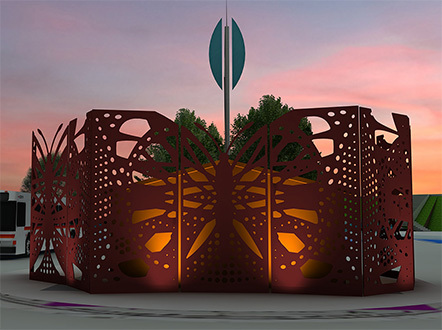 The project is dynamic both day and night, enhanced by the play of light and shadow during the day, and nighttime illumination from dusk to dawn. 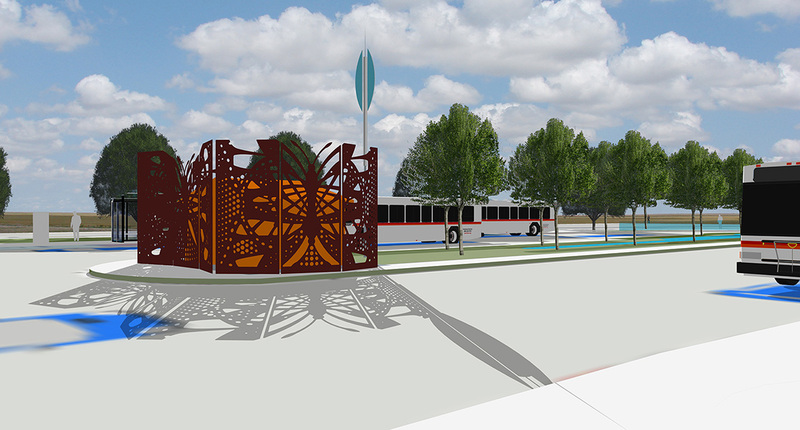 This proposal successfully obscures the transit restroom by using it as a backdrop for an iconic screen that dominates the site. 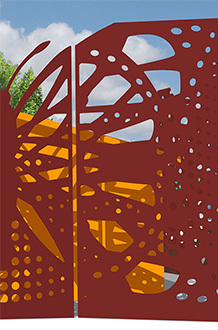 The restroom becomes a canvas for color, and a reflector for lighting, complementing the laser-cut screening. 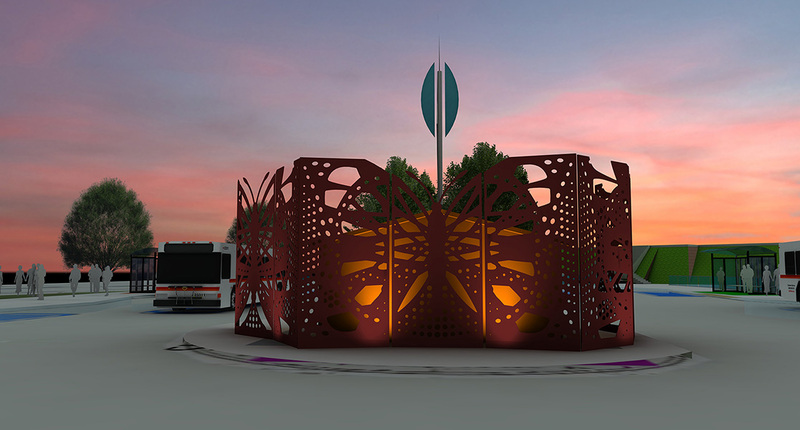 The laser cut screening creates a figure/ground relationship with the transit restroom, providing dynamic patterning with visibility that uses the restroom to complete the image of a monarch butterfly by supplying the warm orange hues of the monarch. 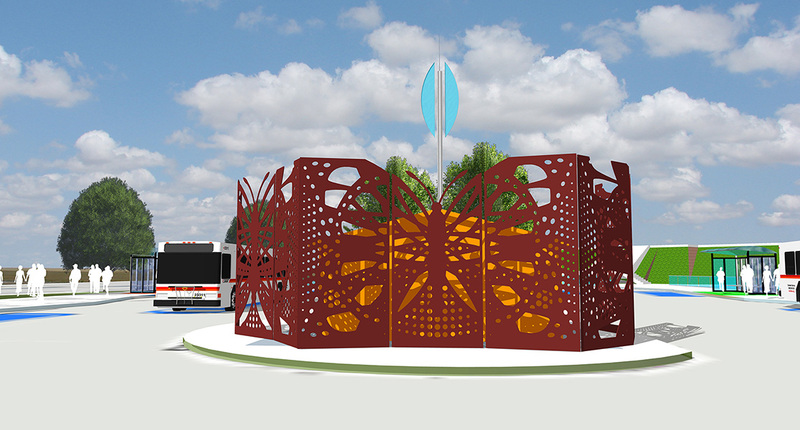 This proposal uses custom cut metal panels to create large pattern screens inspired by butterfly imagery. Each panel is 6’x12’, nom dim. Three panels combine make a screen and three screens are used to wrap the north, east and south sides of the facility building. 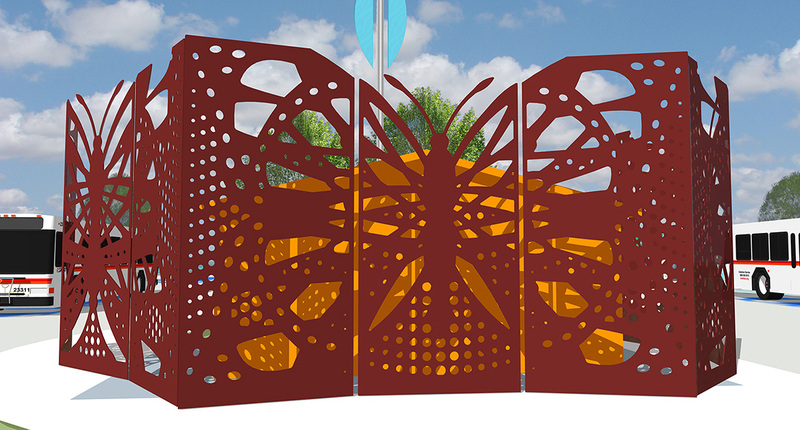 The panels are angled to create facets in the screens, adding a sense of dynamic movement, as if the butterflies were flapping their wings. At night, the artwork lighting illuminated the screens and the facility, transforming them into a lantern-like beacon.